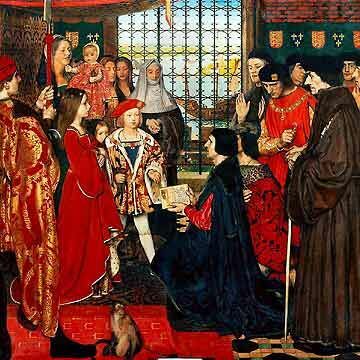 The Family of King Henry VII and Queen Elizabeth of York. Prince Edmund is depicted as the last son on the left. It is most unfortunate that the history of the Tudor kings is preoccupied with the effort to produce male heirs to maintain the dynasty. We all know of King Henry VIII and his six wives and how Elizabeth I had no children causing the Tudor monarchs to die with her. But it’s also true of Henry’s parents. Elizabeth of York was a very fertile queen but many of her children died young. Such was the case of young Edmund, Duke of Somerset. It had been nearly three years since the birth of Princess Mary Tudor. 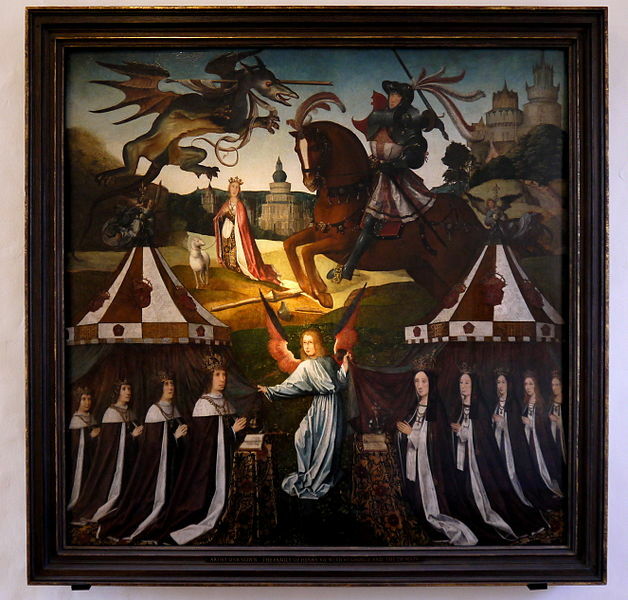 In the summer of 1497, Queen Elizabeth went on pilgrimage to Walsingham, perhaps in an effort to conceive again. She was thirty-three which probably reduced her chances of getting pregnant. It was also a difficult time for England and the Tudor dynasty with an uprising in support of the pretender to the throne, Perkin Warbeck and a fire at Sheen Palace at Christmas 1497 that put the royal family in great danger. By May of 1498, Elizabeth was pregnant. Due to records of payments to physicians, the pregnancy appears to have been difficult for the Queen. In February of 1499, Elizabeth went into seclusion at Greenwich Palace to await the birth. The delivery was easy and a healthy prince was born on February 21, Elizabeth’s sixth child. For unknown reasons, Elizabeth was very ill after the birth causing great concern for her physicians and family. The new son was welcomed and celebrated by all and Elizabeth did recover. The silver font was brought to Greenwich from Canterbury and the baptism was performed in the Church of the Observant Friars on February 24. The Great Wardrobe provided many accoutrements for the ceremony including linen for the font, cords for the canopy that was borne over the infant, gilt nails, and red worsted. The festivities for the christening were considered very splendid. The baby was named Edmund after his grandfather, Edmund Tudor, the Earl of Richmond, father of King Henry VII. Margaret Beaufort, the baby’s grandmother was designated godmother. She gave the child a gift of £100 and rewarded the midwife and nurses. Edmund was given the title of Duke of Somerset although no patent exists showing he was formally ennobled. It was a title which had been conferred on members of the Beaufort family. Edmund spent time in the nursery of Eltham Palace with his elder sisters Margaret and Mary and his brother Henry, Duke of York. The eldest prince, Arthur, did not reside in the nursery with his siblings. In September 1499, the celebrated humanist scholar Erasmus was taken to Eltham by his friend Sir Thomas More to visit the royal children. Nine year old Prince Henry made a significant impression with his royal demeanor already evident to those in attendance. The seven month old Prince Edmund was held in the arms of his nurse during the visit. In the early summer of 1500, plague was epidemic. King Henry and Queen Elizabeth had travelled to Calais on business and stayed for forty days. 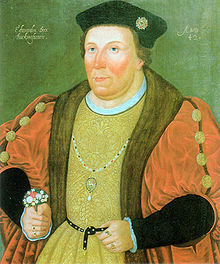 The children were removed to the more remote episcopal palace of Hatfield in Hertfordshire for isolation. The red brick palace had been built around 1480-85 by Cardinal Morton when he was Bishop of Ely. It is the place where Prince Edmund’s niece, the future Queen Elizabeth I, learned of her accession to the throne of England in 1558. On June 16, as the plague abated, the king and queen sailed from Calais to Dover. Either during their return or upon their arrival, they received the disheartening news that Prince Edmund had died at Hatfield. It is possible he died of the plague but there is no knowing exactly what happened. He may have succumbed to any number of childhood diseases or even crib death. The Privy Purse records for the king indicate over £242 were given for the burial of Edmund. He was given a state funeral. The tiny child’s body was laid in a new chest covered with white damask decorated with a red velvet cross along with his effigy crowned with a circlet. The coffin and effigy travelled from Hatfield to London in a chariot covered with black pulled by six horses also covered in black. The chariot was followed by the chief mourner, Edward Stafford, Duke of Buckingham and other lords wearing mourning robes with hoods hanging over their ears. Torchbearers went before the chariot. The Lord Mayor and London guildsmen lined the streets as the procession passed. The King, dressed in blue mourning robes, waited for the coffin to arrive at Westminster Abbey. Elizabeth may have been there too as the ordinances didn’t forbid the appearance of women. The coffin was brought into the Abbey on a hearse. A dirge was sung and the lords kept watch overnight. On June 22, Mass was observed and the coffin was buried in the Confessor’s Chapel. There is no record of a monument being installed to mark Edmund’s place of burial. It was a sad end for another Tudor heir.